We are a family that loves corn. 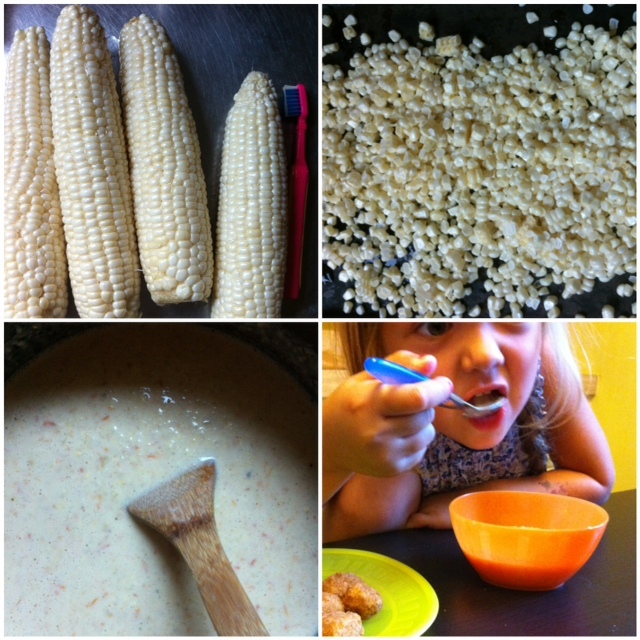 The girls will always eat corn on the cob, it is a summertime dinner staple at our house. So I thought I would take something I know they already love to eat and mix it up (pretty much literally) to see if I could come up with another dinner time option. I found this recipe for Southwestern Corn Chowder from the Food Network which sounded delicious to me. As you read this post I just want to you to imagine that when I first introduced this to the girls I called it "chowda" in my best "harvard yard" accent. So as you can imagine they spent the next few days talking about "chowda" which made me giggle every time. 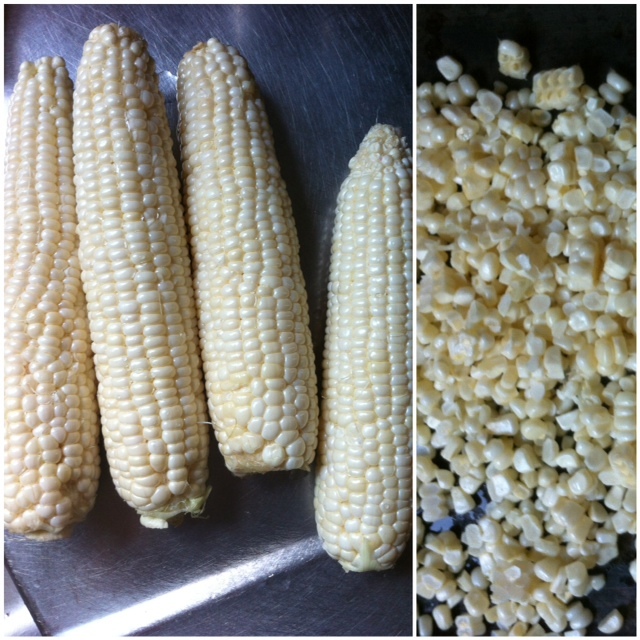 To make the "chowda" we started with four ears of corn that we got at the Farmers Market. Somewhere, a long time ago, I read a tip about brushing corn with a toothbrush to get all the strings off and it works great. I always keep a toothbrush in the kitchen for this and the Bee loves to brush the corn for me. After the corn was all cleaned I cut it off the cob and roasted the kernels on a baking sheet with a little olives oil, salt and pepper in a 500 degree oven until it started to brown a little (about 10 minutes.) I simultaneously roasted some cherry tomatoes on another pan, also drizzled with a little olive oil, salt and pepper. While all that was in the oven, I got out our big soup pot and sauteed 1/2 an onion and some garlic in a little butter. Once the onions started to soften, I added two tablespoons of flour and stirred the mixture until it thickened. I then added three cups of vegetable broth because that was what we had but the recipe called for chicken stock so you could use that too. I stirred the broth and flour mixture until they were well combined. At which point, the corn and tomatoes were finished, so I carefully took them out of the oven and added them to the broth with 1 and 1/4 cups of tortilla chips smashed up. Once everything was added, I poured the mixture into a blender and pulsed it until smooth. I will say that without a doubt this was my favorite dinner we have made so far in this Farmers Market Dinner series! This "chowda" was so delicious and it was a unanimous thumbs up from everyone, which is hard to come by in this house. Yum! I'm making corn chowder for dinner tonight... I can't wait!